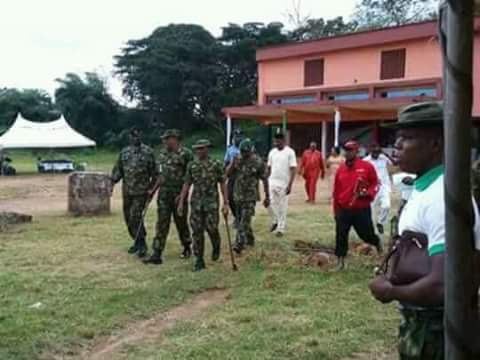 I have received reports and calls stating that a team of people escorted by the military are going to schools in some parts of the state especially in Ekwusigo LGA and others forcifully immunizing school children against an unspecified virus. It was alleged that someone has died from the innoculation. This has caused panic in the entire state. I have liaised with the State Commissioner for Health, Dr. Akabuike, who is on his way to Ekwusigo for fact-finding. As a precautionary measure, schools in the state have been closed for today and parents are to go and pick up their children/wards. 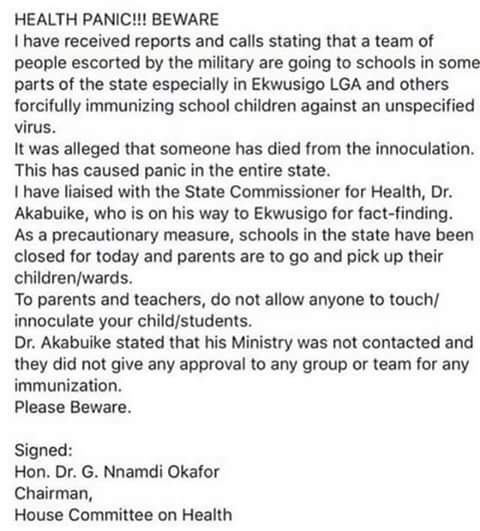 To parents and teachers, do not allow anyone to touch/innoculate your child/students. 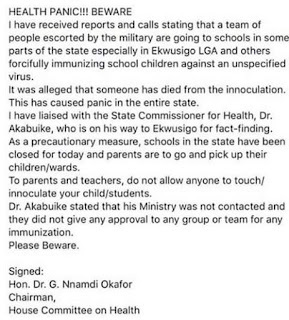 Dr. Akabuike stated that his Ministry was not contacted and they did not give any approval to any group or team for any immunization.